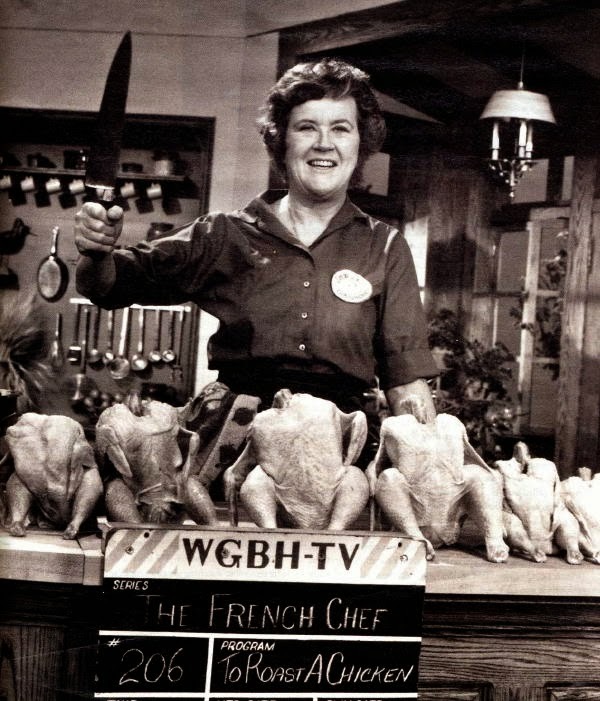 I decided to try to improve my roast chicken, take it up a notch so to speak, so I went to the master — Julia Child — and decided to try her method. As usual, it was a wordy and overly complex situation, but the cooking notes are perfect and the results delicious. Preheat the oven to 425°. Melt 1 tablespoon of the butter in a skillet. Add the diced carrots, onion and celery and cook over moderate heat until softened. Stir in the herbs. Wash the chicken rapidly inside and out with hot water and pat thoroughly dry. Salt and pepper the cavity and spoon in the cooked vegetables, a handful of parsley stems and celery leaves and the lemon slices. Massage the chicken all over with 1 tablespoon of the butter, tie the ends of the drumsticks together and tuck the wings under the body. Choose a flameproof roasting pan that is about 1 inch larger than the chicken. Salt the chicken all over and set it breast-up on a rack in the pan. Roast the chicken in the oven for about 1 hour and 15 minutes, as follows: At 15 minutes brush the chicken with the remaining 1/2 tablespoon of butter. Scatter the sliced onion and carrot all around. Reduce the oven temperature to 350°. At 45 minutes, brush the lemon juice over the chicken. If necessary, add 1/2 cup of water to the vegetables to prevent burning. At 60 minutes, baste with the pan juices. Test for doneness: The drumsticks should move easily in their sockets; their flesh should feel somewhat soft. If not, continue roasting, basting and testing every 7 to 8 minutes, until an instant-read thermometer registers 165°. Let rest on a carving board for 15 minutes; discard the string. Spoon all but 1 tablespoon of fat from the juices in the pan. Add the stock and boil until lightly syrupy, 5 minutes. This makes a lovely gravy. First of all I love that photo! Second of all,I wash and dry my bird because plastic packaging sometimes makes the bird smell a little gamey and I like to start with freshness whenever possible. oops! My comment got eaten, but not in a good way, like eating chicken. lol. Glad you liked the photo — all those birds are pretty hilarious. And that KNIFE! Look out!